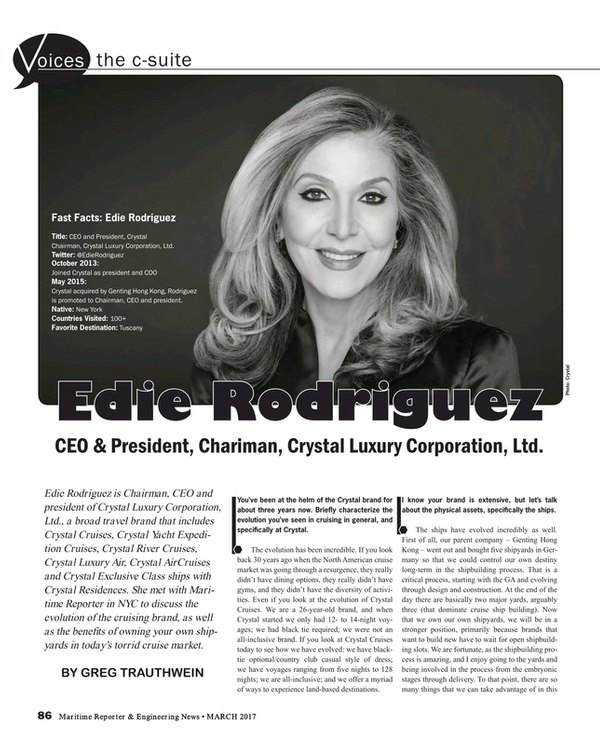 Edie Rodriguez is Chairman, CEO and president of Crystal Luxury Corporation, Ltd., a broad travel brand that includes Crystal Cruises, Crystal Yacht Expedition Cruises, Crystal River Cruises, Crystal Luxury Air, Crystal AirCruises and Crystal Exclusive Class ships with Crystal Residences. She met with Maritime Reporter in NYC to discuss the evolution of the cruising brand, as well as the benefits of owning your own shipyards in today’s torrid cruise market. WiFi, because people cannot not be connected at sea. We had a couple that went on a four-month around the world cruise for their honeymoon. The only reason that they could do that was because of WiFi; the husband was able to take his business on the road. Chairman, Crystal Luxury Corporation, Ltd.
May 2015: Crystal acquired by Genting Hong Kong, Rodriguez is promoted to Chairman, CEO and president.